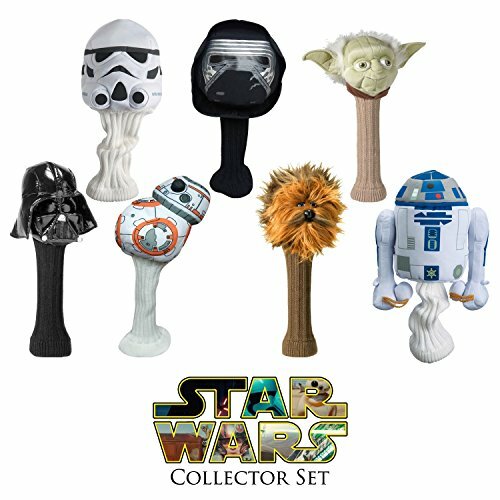 Awaken the force with the 7pc Complete Star Wars Collector's Golf Head Cover Set! This set comes with 7 of the most infamous characters from George Lucas's Star Wars universe: Yoda, Darth Vader, R2D2, Stormtrooper, Chewbacca and introducing 2 new characters Kylo Ren and BB8! Each of these head covers is designed to fit drivers and woods up to 460cc. All of the seams feature reinforced stitching to protect your clubs, and lots of extra padding not just for show! The long sock will protect the shaft of your clubs, and each character is sure to turn heads on the green! Make sure to grab this set for your favorite Star Wars golf enthusiast!